Saving a report makes it easy to quickly generate the same type of report at a later date. 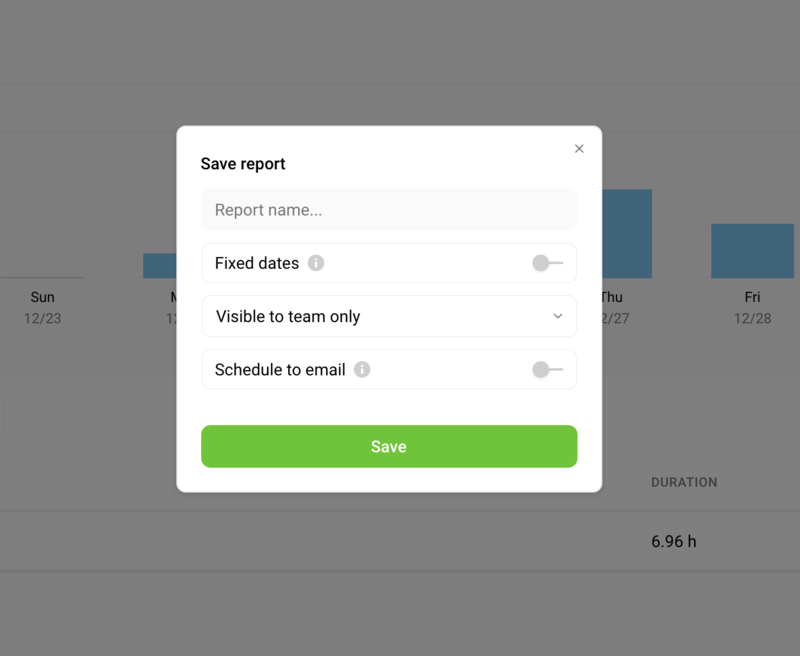 Saved reports can be shared among team members or even with people who don’t have a Toggl account. Saved reports require a paid plan to use. They are not accessible on the Free plan. Pick the filters / data grouping you’d like to the report. Click on the highlighted Save icon (available in Summary, Detailed and Weekly Report). Click the slider to set to "Yes" and the date range of the report cannot be changed. Set this to "No" if you plan on using the report once a week, month, etc. Set the option to "Public" if you want to share the report with person who doesn’t have a Toggl account. Setting it to "Public" will also make the report visible to all users in your Workspace. Part of the Scheduled reports to email feature. The feature is available only on the Premium Plan. It allows you to periodically send the saved report to yourself or any other member of the workspace. Saved Reports page is accessible from the main sidebar on the left. From this page you can copy the report URL, change the report's visibility (make it public or private) or delete reports. Deleting a saved report makes the link inactive and prevents it from being accessed anymore. Only the person who created the saved report is able to delete it.